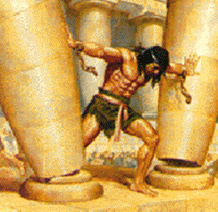 The Samson Option is a term used to describe Israel’s alleged deterrence strategy of massive retaliation with nuclear weapons as a “last resort” against nations whose military attacks threaten its existence, and possibly against other targets as well. Israel refuses to admit it has nuclear weapons or to describe how it would use them, an official policy of nuclear ambiguity, also known as “nuclear opacity.” This has made it difficult for anyone outside the Israeli government to definitively describe its true nuclear policy, while still allowing Israel to influence the perceptions, strategies and actions of other governments. They named it after the Biblical figure Samson, who pushed apart the pillars of a Philistine temple, bringing down the roof and killing himself and thousands of Philistines who had gathered to see him humiliated. They contrasted it with ancient siege of Masada where 936 Jewish Sicarii greatly outnumbered by Roman legions committed mass suicide rather than be defeated and enslaved by the Romans. Given suspected U.S. nuclear primacy plans, Russia could feel compelled to attack the United States for acts like a U.S. nuclear attack on Iran, which is just a few hundred miles from its border. Once there is any use of nuclear weapons, it will be like giving permission for anyone to use them. Compare it to a room full of people embarrassed to cough, but once one does, everyone else feels free to do so. Endtime Ministries presents an excerpt from the Dec. 2nd show with Irvin Baxter. A group of malicious hackers who attacked Twitter and the Chinese search engine Baidu are also apparently running a for-rent botnet, according to new research. The so-called Iranian Cyber Army also took credit last month for an attack on TechCrunch’s European website. In that incident, the group installed a page on TechCrunch’s site that redirected visitors to a server that bombarded their PCs with exploits in an attempt to install malicious software. Researchers with a security startup called Seculert have traced the malicious server behind those attacks and found indications that the Iranian Cyber Army may also be running a botnet. There are many computer crime gangs that create botnets, or networks of compromised computers, that can then be rented to other players in the cybercrime industry, such as spammers. The Iranian Cyber Army is believed to be behind the botnet since the administration panel showed the same e-mail address that was displayed after the Twitter and Baidu defacement attacks. Also, a page displaying statistics on the number of infected machines showed the group’s name in its HTML source code, according to screenshots posted by Seculert. The statistics page showed that as many as 14,000 PCs were being infected per hour. Since the server has been active since August, Seculert estimates it may have successfully infected as many as 20 million PCs. The botnet has been used to distribute some of the more notorious malicious software programs including Zeus, which is used to hack into online banking accounts, and the data-stealing Trojans called Gozi and Carberp, Raff said. An e-mail address links the botnet to earlier attacks claimed by the Iranian Cyber Army. 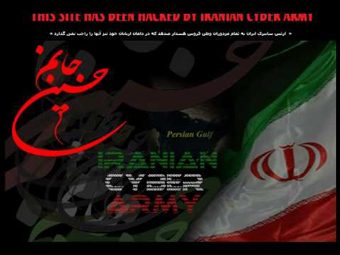 When Twitter was attacked in December 2009, users were direct to a different website bearing a green flag and the message “This site has been hacked by Iranian Cyber Army,” along with the group’s supposed e-mail address. As I wrote in my last article, (Cyber Army and Stuxnet in a Cyber war) Iran’s regime like to retaliate with a cyber attack against Israel or the West and I think that’s what they’re doing now. What would you do if you knew you only had 7 yrs left? Endtime Ministries presents an excerpt from the September 8th show with Irvin Baxter. Visit Endtime.com/radio to view the entire show. Fidel Castro has sounded the alarm bells over a nuclear holocaust ending humanity. The eighth round of Iran-Venezuela’s energy talks as part of the two countries’ efforts to boost mutual cooperation in oil, gas and petrochemical industries will be opened in Tehran tomorrow. The two-day energy talks will focus on the establishment of a joint oil shipping company as agreed in a memorandum of understanding the two countries signed last year, the construction of petrochemical units and participation in Iran’s South Pars gas field. Over the past five years, Iran and Venezuela have signed various memorandums of understanding and contracts to set up a joint oil shipping firm and participate and invest in oil and gas fields. According to Tehran and Caracas oil officials, the launch of the joint oil shipping company will transport nearly 500,000 barrels/day of Venezuela’s crude oil barrels to Asian and European markets, Press TV reported. Venezuelan President Hugo Chavez is set to arrive in Iran on Monday to discuss the expansion of relations between the two countries, according to Iran’s semiofficial Fars News Agency. Chavez will stay for two days in Tehran, and will be accompanied by a Venezuelan delegation, Fars said. He will meet with Iranian President Mahmoud Ahmadinejad and other officials. 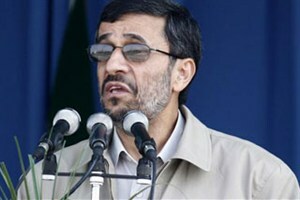 Mahmoud Ahmadinejad, the Iranian president, has declared that the people who built Israel were “mortal”, in remarks that revived his charge the Jewish state should be wiped out.